Wordle generated from word associations with “Wikipedia” at the beginning of the semester. This week is the final session in the Wikipedia as a Research Tool class I taught this semester to Freshman in the Undergraduate Honors Program at the University of Memphis. I have blogged a bunch in the past, most recently last week, on the merits of Wikipedia in both higher education, cultural heritage and museum studies, and as an information resource. Generally, I find that Wikipedia gets a bad rap largely from ignorance about the evolution of the resource or from those not understanding the intent of the tool. Regardless, on the first day of class this semester I aimed to gauge the students knowledge of Wikipedia, determine their specific interests in the subject, and go from there. I had in mind that each student would create their own Wikipedia article or substantially edit an existing page. Early on I made contact with Jami Mathewson from the Wiki Education Foundation. Jami sent me a packet of information that included a 12-week syllabus for writing a Wikipedia article. Wikipedia has many intro and how-to brochures/tutorials available through Wikimedia Outreach. I did not use all the resources available to me as an instructor in the course, especially having the students turn in all assignments in the Wikipedia course space. Next time I likely will. My own syllabus follows the one Jami provided, supplemented with additional assignments and readings. My additions focused less on a discussion of Wikipedia and more on the concepts of user-generated content, open authority and public access. In class, I noted to students that Wikipedia will give way to something else, in the same way that Friendster, was replaced by My Space which lost out to Facebook, which will be overshadowed by something else. One course objective was to contextualize Wikipedia within the noted concepts. For example, a portion of the student’s final assignment is to assess the recent MIT Technology Review article The Decline of Wikipedia. On the first day of the semester and again this past Tuesday now nearing the end of the semester, students created a list of word associations for the term Wikipedia. The lists were spontaneous responses. The instructions were simple “Take out a piece of blank paper and write your name at the top.” When everyone had done so, I instructed the students to “Write a list of words that you associate with Wikipedia.” The students responded for two minutes. The wordle or word cloud at the top of this post is from lists the students created on the first day of class. 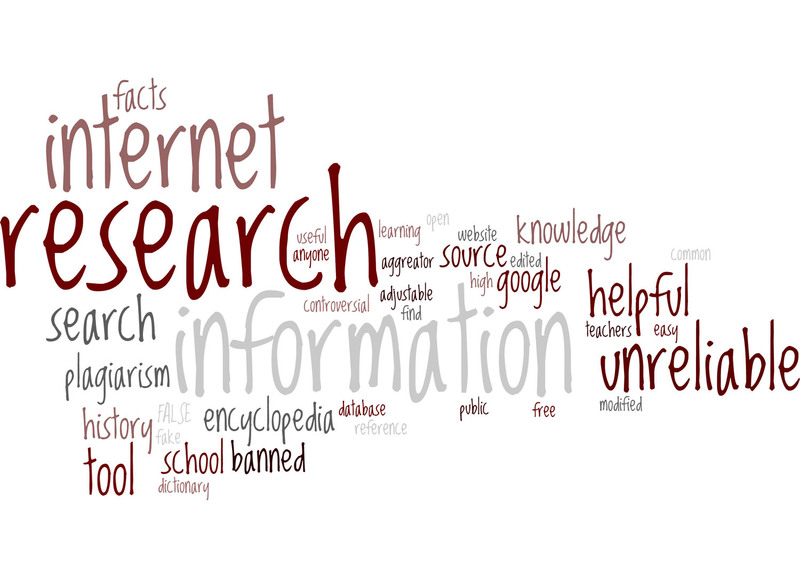 The wordle below is from the lists the students created this past Tuesday. Research, the most common word listed at the start of the semester is completely missing at the end of the semester. This change likely reflects a consistent class discussion over the semester that Wikipedia is a very useful starting point to obtain information, but not the final stop in doing scholarly research. Unreliable in the first wordle is completely missing from the wordle at the end of the semester and is replaced by reliable and at the same rate. This switch is very easy to understand. Most students, commented in their weekly reading journals how surprised they were at the amount of editing done on Wikipedia articles as documented on article history and talk pages. The students were also surprised at how quickly other users edited their own articles, in some cases adding references, in other instances deleting content that was not neutral and expressed a specific point of view. The shift from unreliable to reliable also reflects a concern raised by students on the first day of class – they felt ill-prepared to argue against their high school teachers who banned or strongly discouraged the use of Wikipedia. Their own experience with Wikipedia provided them with the arguments they needed. Of note neither plagiarism or school banned appears on the final wordle. 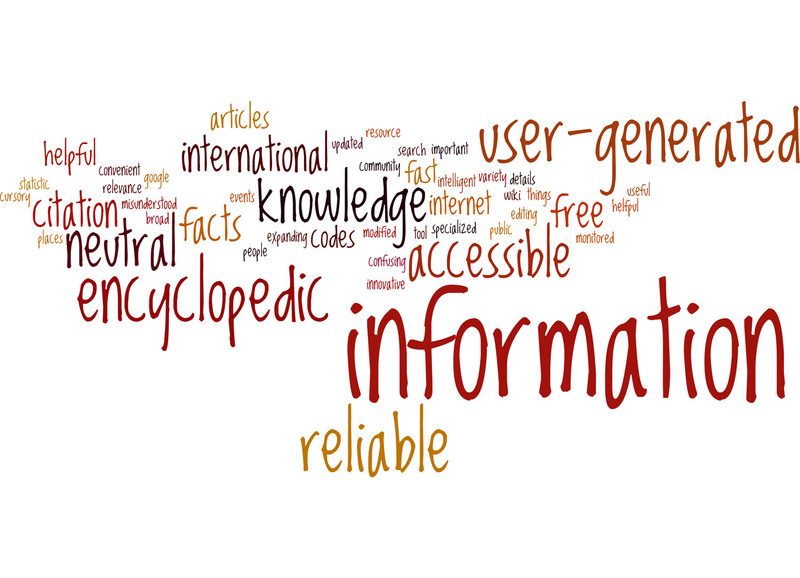 Other terms that appear in the wordle at the end of the semester such as user-generated, free, citation, accessible, neutral, and encyclopedic represent an appreciation of the Five Pillars of Wikipedia. International is a very logical inclusion on the final wordle for students who spent any time exploring the Wikipedia education pages. “The monkeys takeover. Say good-bye to today’s experts and cultural gatekeepers – our reporters, news anchors, editors, music companies, and Hollywood movie studios. In today’s cult of the amateur, the monkeys are running the show. With their infinite typewriters, they are authoring the future” (p. 9). In Part 2 of this post, the students will speak. Wordle generated from word associations with “Wikipedia” at the end of the semester. I would say that you have successfully duped the students into mimicking your point of view. Whenever I lecture students about Wikipedia (as I recently did at Rollins College, or at Cheltenham High School), the result is much different. Students leave the lecture with grave doubts about the reliability of Wikipedia, because I don’t sweep the problems under the rug. I expose them. I’m happy to share links to my past presentation decks, if there is interest. Thank you for your comment. Please do share your links to your past presentation decks. I regret if my post in any way gave the impression that I sweep the problems of wikipedia under the rug. In fact, over the course of the 15-week semester, students are exposed to the both pro and con of Wikipedia on each point considered. Students watch videos and read papers from some of the most ardent opponents of Wikipedia. What I believe is key to the process is that students then explore, edit, and create articles in Wikipedia themselves. I was particularly pleased that the word “research” was missing from the trait list composed by students at the end of the semester whereas “information” remained. Although I expect to hear more from students on this issue in their final exam, as I noted in my post, I suspect that this switch reflects the realization that Wikipedia is no more a “research” tool than the set of encyclopedia that I grew up with and was not permitted to cite as a resource in my research projects. Rather, Wikipedia is a fantastic starting point. I see myself less as an advocate for Wikipedia and more an advocate for quality open source and user-generated content. Over the past 10 years, Wikipedia has been a true pioneer in that effort. Have any of the students been introduced to the leading Wikipedia criticism site, Wikipediocracy? Have any of them been introduced to my series of journalistic investigations of the governance structures at Wikipedia and at the Wikimedia Foundation? If not, then I’m not sure we can honestly say you’re giving students an earnest exposure to the problems of Wikipedia. I’m happy to hear that you don’t see yourself as an “advocate” for Wikipedia, and I also look forward to the day it is replaced by something better. I would provide you links to my presentations, but apparently your site will not allow links, even in plain text without HTML formatting. To be clear, I did not write that I was not an advocate for Wikipedia – rather I wrote that “I see myself less as an advocate for Wikipedia and more an advocate for quality open source and user-generated content.” As I noted in my original blog post Wikipedia will likely give way to something else in the future – that is the evolutionary process. To be clear as well, I encouraged my students today to read your comments and follow the links you provide as they are quite informative on an alternative perspective. In so doing they can make up their own minds. Regarding posting your links – I am not certain what you mean re not being able to post same – as you are able to post links to your wiki page. You state the theory that Wikipedia will be replaced by something else as an axiomatic fact. What’s the dynamic you theorize is behind this? Where is the evidence? The dynamic is the rapid growth of digital technology, user generated content and all that is the internet. As I note in my post, Friendster, to My Space, to Facebook, to Instagram – social media has evolved, not gone away.